The Missive Maven: Tsar Nicholas II postcard... and stamp? 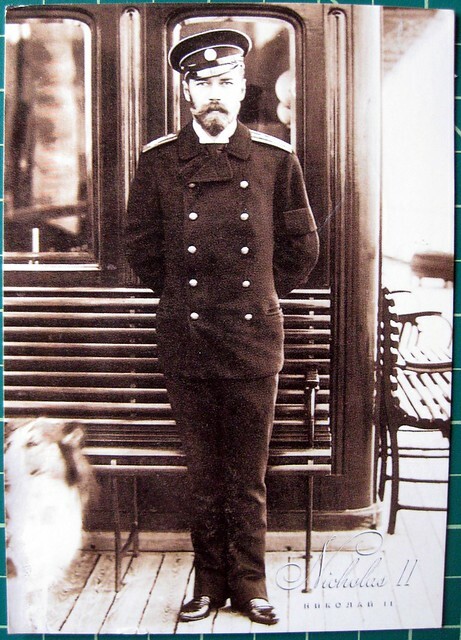 This excellent postcard of Tsar Nicholas II came to me from a Swap-bot swap for a famous person postcard. I really love the mood of this image, and of course we know that Nicholas II had a very bloody history, as the postcard sender noted in what she wrote to me. Here, he appears aboard the yacht "Polar Star" in the early 1900s. I love the dog next to him. I'm also quite taken with the stamps... is that oval also showing Tsar Nicholas II? I can't really tell, there's no name, but they certainly look similar. Anyone know? 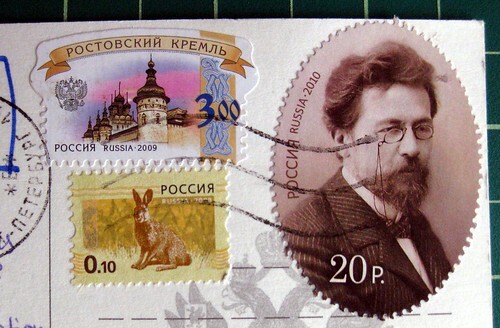 **UPDATE:** Thank you, educated blog readers - it is Chekhov, a stamp commemorating the 150th anniversary of his birth. The portrait stamp is of Chekhov, in honor of the 150th anniversary of his birth. No wonder people have always been so captivated by the Tsar (a Czar by any other name...) and his family. They were all so amazingly beautiful. Russia has some of the coolest shaped stamps. Yes this is the one historical family that fasinates me to this day . The czar Nicholas and the czarina and their family the romanoffs . the dog next to him I believe is a russian wolfhound . Yes they were all so elegant and regal and met such a tragic end . They captivate me . Terrific card and stamps! "People" cards used to not interest me, but they're fast becoming one of my favorites....and if there's a dog somewhere on the card, too, even better! The dog kinda looks like Lassie, to me. I'll have to google Russian wolfhounds.